Out of all the countries I have been to, Turkmenistan is the weirdest one. It is one of the least visited countries in the world and only receives a couple thousands of tourists each year. If you are going here, it means that you have managed to get one of the few tourist visas that the government gives out. Either that, or you are an expat who has come to work in Ashgabat. But either way, you now have the chance to explore one of the least visited countries in the world, one that pretends to be open to tourism but shuts itself off from the rest of the world as much as possible. “Dictators do not want tourists,” our guide said. Turkmenistan ranks third last in Reporters Without Borders ‘World Press Freedom index’, being just a bit better than Eritrea and North Korea. Since little is known about this country, I was curious to explore it. For me, this was the start of a thirteen-month trip around the world and I couldn’t have chosen a more interesting first stop. Ashgabat is the strangest city I have ever been to. Imagine driving through a desert, with rocks and sand as far as the eye can see, and then, suddenly, a city built of white marble appears on the horizon. 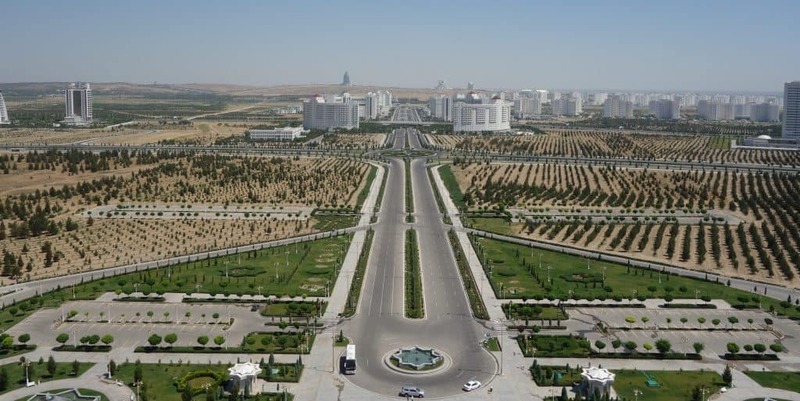 Before coming to Ashgabat, I had known that the city was constructed out of white marble. I just hadn’t known to what extent they loved this rock. Every official building was built of white marble, with some of the strangest architecture I have ever seen. Parks and fountains were constructed of white marble. Monuments. Apartment blocks. And we’re not just talking about the fancy apartments. The regular ones are built with white marble, too, creating what my friend appropriately called a ‘white marble ghetto’. I highly recommend walking through the city to get an idea of its weirdness. You will come across boulevards adorned with white and golden street lamps but you will not see cars on any of the six lanes. Go towards the nice apartment blocks rising high into the sky but don’t expect to see anyone on the streets or any decorations on the balconies. Walk around Independence Square (don’t take pictures here – this is where I got arrested on my first day in the country) to appreciate the beautifully domed marble buildings. Take a city tour by bus to get to see some of the weirdest monuments you have ever seen and make sure to drive past the world´s largest indoor Ferris wheel. And don’t forget to go up to the Wedding Palace at night when all the marble buildings are lit up. The old town of Nisa was once an important stop on the Silk Road. These days, all that remains are a few ruins near Ashgabat. It belonged to the Parthian Empire, a civilisation I hadn’t even heard about before visiting Turkmenistan. They existed around 2000 years ago and were powerful enough to stop any Roman expansion towards the East. Not only that. 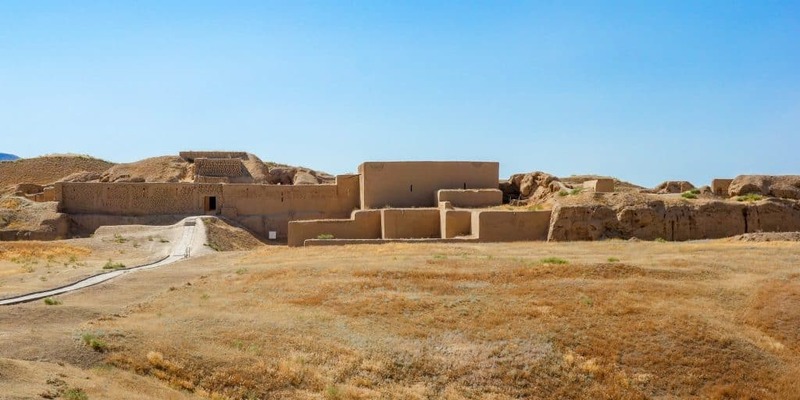 The city of Nisa also served as an important trading centre along the Silk Road and in a North-South direction. This fortress is a great half-day trip from the capital. You won’t spend more than an hour here, but where else in the world do you get the chance to have a Unesco World Heritage site to yourself? You can either ask your guide to take you here (since you must have one in Turkmenistan) or come by public transport. The latter option is the most interesting one. After all those empty streets in Ashgabat, hopping on a bus gives you the chance to come in contact with locals. Look up some Russian words before you set out, the locals really appreciate you saying hello and thank you in a language they can understand. Besides that, all you need to do is tell your bus driver that you want to go to Nisa. I have found people to be extremely helpful in Turkmenistan. Our bus driver went on a detour to drop us off in the right place and then refused to accept any money from us. So if you have the chance, take the bus for an additional adventure. 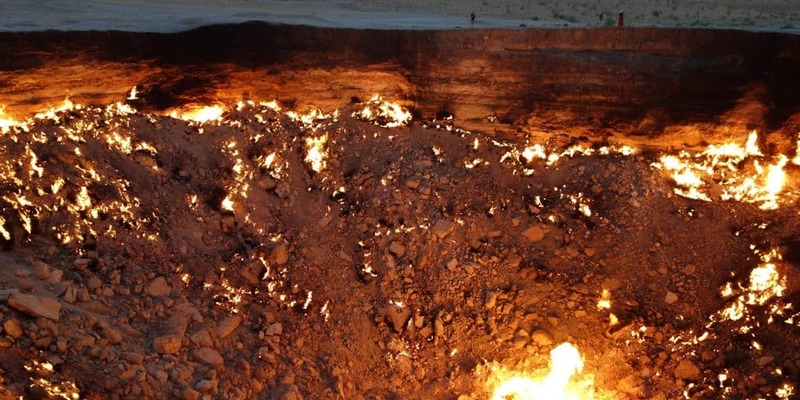 The Darvaza Gas Crater is also known as the “Door to Hell”. Turkmenistan is a country rich in gas. When an underground cavern collapsed and formed this natural gas crater, scientists set it on fire and predicted that the gas resources would last for a week. That was more than forty years ago. Since there are no hotels near the crater, your best option is to camp here. That way, you can enjoy it during the day and at night. We were maybe 200 meters from the crater and could see its glow from our campsite, which made it a very spectacular camping spot. Nobody knows when the city of Urgench was founded, but it became important as a Silk Road town between the 10th and 14th century. Today, a couple of mosques, mausoleums, a minaret and the doors to a caravanserai remain. Most of the buildings were being renovated when I got here, but its historical significance still makes it an interesting stop on any tour through Turkmenistan. And with renovations being underway, let us hope that people can see more of that city in the future. Turkmenistan is all about the Silk Road. The remains of Merv are no exception. I unfortunately did not get to go here since we crossed the border to Uzbekistan after Konye Urgench, but I would have loved to see the ruins. Merv was founded more than two thousand years ago and has played various important roles since then. Arabic and Persian scholars used to call it “the mother of the world”. It was once a centre of Muslim scholarship, along with Samarkand and Bukhara, and also functioned as an important Silk Road trading town. Don’t make the same mistake as me and skip it. 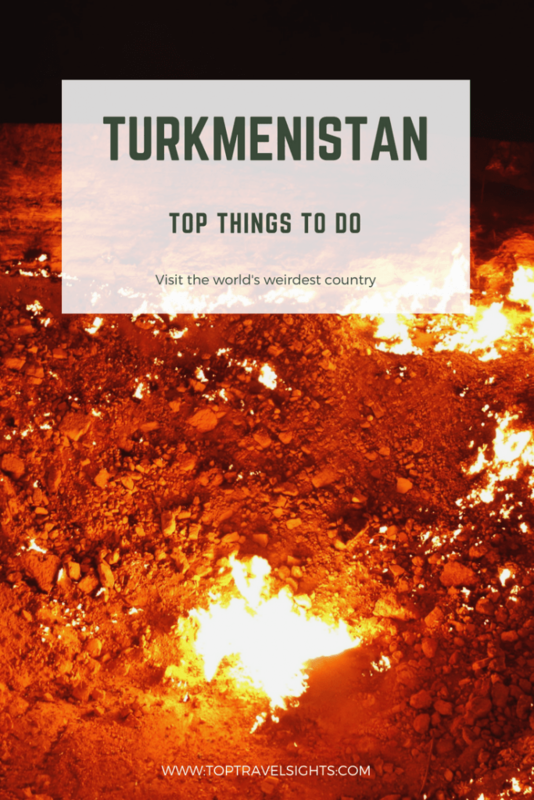 I hope you now have an idea of what to do in Turkmenistan, the weirdest country I’ve ever visited. I know it’s not the most popular spot for travellers, but it is totally worth visiting. 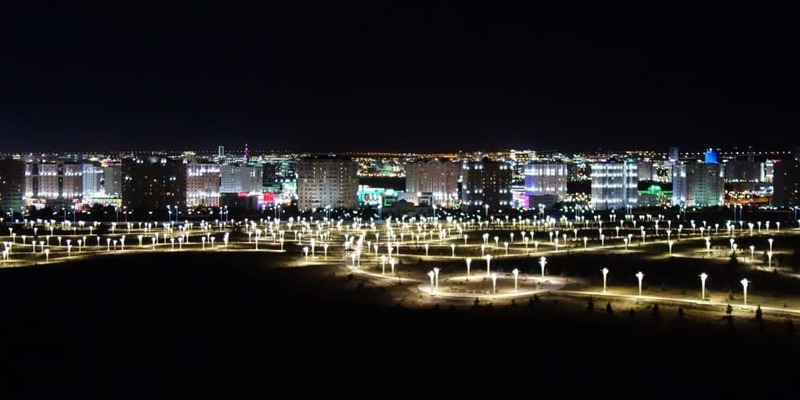 If you manage to get here, you will almost certainly go through Ashgabat, so read up on what to do there. Also, please let me know if you’re planning on travelling to Turkmenistan or if you’ve already been there. I’d love to hear from someone else who is interested in this strange country!